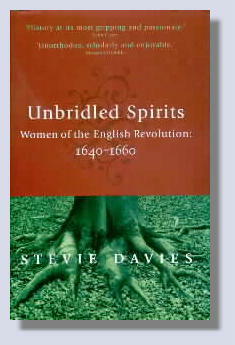 Unbridled Spirits: Women of the English Revolution: 1640-1660. By Stevie Davies. London: Women's Press, 1998. xii + 356 pp. Notes, bibliography and index. £17.99. Unbridled Spirits is a book that appeals to both the curious beginner and the academically minded student. Davies’s aim is “to kindle the imagination of readers coming fresh to the 17th century but have a dismaying sense that the period is inaccessibly difficult”. The book bears a striking similarity and should be seen as a supplement to Christopher Hill’s book The World Turned Upside Down. Davies examines the same groups of radical sects that Hill did in his landmark book but from the standpoint of women. Davies acknowledges her debt to Hill and other left-wing historians. Davies describes being "raised on Christopher Hill." I am not sure of Davies political views, but her book is clearly influenced by Hill and others radical historians concept of the study of “history from below.” Davies is not entirely uncritical of Hill’s work in that she believes he has a tendency to equate the people with men. It is a charge that is accurate and perhaps surprising. Despite writing in the tradition of history from below, I do not believe the book or the writer espouses a sympathy for gender studies that seems to dominate the study of women in history at the moment. Gender historiography is a relatively new concept in which to explore women’s role in history. It is largely a by-product of the genre “History from below” instigated by the Communist Party History Group. While producing some precious research and publications, the replacing of gender over class in the study of historical events was a move away from a classical Marxist approach. Gender studies became especially intense in within the History Workshop movement. The growth was facilitated by such books such as E.P. Thompson’s The Making of the English Working Class in the early 1960s provided a platform for gender studies to grow. This coincided with the rise of independent women historians and writers who “insisted that women's experience no longer is 'hidden from history.' Sally Alexander and Anna Davin, 'Feminist History,' History Workshop Journal, no 1 Spring 1976; Barbara Taylor, Eve and the New Jerusalem: Socialism and Feminism in the 19th Century, 1983.To name just two. In his review, John Carey describes Davies’s book as “vibrant and authoritative study of the women of the seventeenth century, women whose voices have been lost until now. Stevie Davies resurrects forgotten texts to bring to life prophetesses who predicted the fall of the king and the rise and fall of Cromwell; Peace Women who marched against the war; Leveller women who condemned oppressive legislators and abusive taxes; Fifth Monarchists who attacked the government; separatist women who founded dissenting churches and spoke for liberty of conscience; and radical Quakers who stood for gender and class equality”. While it was dangerous for men to question the existing political and economic setup, for women at the beginning of the 17th century, it was nearly impossible. But women of all classes managed to be heard and some cases very loudly. The explosion of printing presses enabled women with little money to spread their ideas and propaganda to a wider audience than ever before. The book is infused with the spirit and drama of the revolution. It is an overused phrase but in this instance a correct one that the world was turned upside down. A striking aspect of the book is that it is extremely well researched. It would appear that Davies must have slept overnight in many of the libraries she studied in. Her use of primary sources is excellent. While some writers have put forward that the struggles of these women of the 17th century bear little resemblances to modern day struggles. I tend to disagree. While not on the same scale many aspects are the same. In many jobs, women are still treated like second class citizens and paid accordingly, and the concept that women’s role is best served by remaining in the home is still alive and kicking. So Davies book does not just stand as a history book but has a contemporary significance. Davies began her early career as a literary critic and renowned novelist. A good training ground for her later development into a first-rate historian. Like Christopher Hill did with male radical figures Davies manages to bring to wider audiences brave women such Anna Trapnel, Margaret Fell and Lucy Hutchinson to name just a few. Many of these women despite enormous hardship probably lived life more fully in those short years of the revolution than many of us live in our lifetime. While it is correct to say that the women were treated with fear and persecution it should be noted after people got over the initial shock of hearing these politicized women they began to get a hearing and find and audience and not only amongst other women.In normal times these women would be mostly seen but certainly not heard, but these were extraordinary times and conditions were being made for layers of the population to have a voice. One of these incredible moments was when the Army Council met in December 1648. Charles 1st had been roundly defeated by Cromwell and the New Model Army. At a time when dual power presided between Parliament and the army, a debate opened up as what to do with the King. Sections of the military which were to the left of Cromwell wanted The Man of Blood to be brought for trial. Cromwell himself was undecided. Parliament was for a deal with the monarch. Given women’s lowly position in society, it seemed inconceivable that a leading radical female would be invited to the highest ruling body of the army while it debated the trial of Charles I but this is what happened. A young prophetess from Abingdon, Elizabeth Pool was invited to impart her wisdom. She opposed the trial and killing of the King. This position which was to the right of the army council was rejected. In fact on the execution of the King most of the radical sects were opposed to it. The book does not develop a conventional narrative. Although there is some interrelationship between the chapters and the events, they depict most of them stand alone. Chapter nine is one example of this approach. It discusses three Puritan marriages. In one form or another relationships were based on social equality. Perhaps the most important and certainly my favorite is Davies’s work on the Quakers. The movement of Quaker party is seen through the lives of Margaret Fell, her husband Thomas, and George Fox, who was Fell’s second husband. Fell seemed to embody all that was active, creative and brave in the women of the time. According to Anthony Fletcher “She was formidable indeed, an aggressive controversialist into her eighties, whose stamina did not fail. In a sense, Margaret Fell stands for the many unbridled women that this book seeks to celebrate. It was she who delivered by hand to Charles II in 1660 the Quaker manifesto which enshrined the basic claim: "we are people that follow after those things that make for peace, love, and unity." The book has been met with favorable reviews. Having said that one harsh voice, William Lamont made this criticism “the author brings her narrative skills to bear in making the story come alive. She often writes in the present tense, and she does not miss a chance to emphasize the humorous and ironic side of the events she describes. Although she does not make any glaring factual mistakes, this treatment tends to rob her subjects of their full dignity and to suggest their motivation came more from the unconscious need to overcome their social oppression, which was certainly necessary, than from a genuine movement of the Holy Spirit. While her treatment of Quaker women is more respectful than that of some of her other subjects, one might wish for a less arch tone. Readers wanting a more in-depth treatment of the same period would do well to go on to read Phyllis Mack's Visionary Women, or the anthology by Mary Garman, Judith Applegate, Margaret Benefield, and Dortha Meredith, Hidden in Plain Sight, for treatment with more depth”. Lamont ends his review by wishing “Stevie Davies has many readers”. That is the hope of this author.